The Suffolk town of Eye lies on the great boulder clay plateau which stretches down from across the Norfolk border, south and west into Essex. Irregularly shaped fields, scattered farms and small woods mark out this land from medieval times. Eye is recorded as a burh by the time of Domesday book, indicating that it was already a significant market town, created under the auspices of a great lord, either ecclesiastical or land-owning. The names is generally accepted as being derived from a Saxon word meaning 'island', indicating an area of land surrounded by rivers and marshy land; the nearby river is the Dove, a tributary of the Waveney. Eye and the area show signs of occupation throughout the periods of history, but without a specific settlement. The Roman period suggests more of a small settlement through evidence of buildings and coins, mostly from the late Roman period. An Anglo-Saxon cemetery of the 6th century indicates something of a small town at that time. Edward the Confessor gave the manor of Eye to Edric of Laxfield, his falconer. Eric had to hand over the town to William Malet, one of the Norman lords who had fought alongside William the Conqueror at the battle of Hastings. Edric had already built a castle, but William Malet soon built a more substantial mound and wooden castle; his successors would rebuild in brick. The castle and more particularly its outworks, the bailey, would greatly influence the shape in which the town would develop. Traders who served the castle, servants who worked at the castle and others with interests in it as a centre of power gathered around its gate. Over the years, the castle would survive two substantial attacks. Robert Malet founded the Benedictine priory of Eye, early in Norman times. The charter gave to the priory considerable financial benefits from the town, including tithes from the market and the church, the churches of Dunwich and a lot of other churches in the district. The foundation was so wealthy that even popes in Rome endeavoured to get a share of its income! It prospered over the centuries, though it did suffer as Dunwich lost its several churches and their tithes to the sea - and in fairness it does seem to have made regular generous donations to the poor. The church of St Peter and St Paul is a particularly fine example of the many splendid churches of the county. As is often the case, due recognition must be made of the restoration work carried out at the end of the 1860s; nevertheless the central structure dates from the early 14th century and the splendid rood screen from the 15th century. Again, as is frequently the case, there is evidence of an earlier church on the same site; in this instance such features as a door in the south aisle are taken to belong to the earlier building. 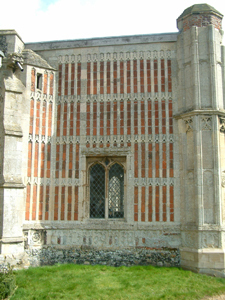 Pevsner describes the tower as one of the 'wonders of Suffolk', it has splendid examples of East Anglian flushwork, where imported limestone and local flint are combined in patterns and symbols. Eye is particularly impressive through its chequerboard patterning. With the castle becoming ruinous late in the 14th century, the town may well have settled as more of a regular East Anglian town, serving its locality through being a market for agricultural produce. Records do suggest a specialisation in the town of lace making, this being a substantial industry before the coming of industrialisation and surviving in a lesser form through to the early 20th century. When Daniel Defoe visited the area in the 1720s, he refers to the whole of the countryside being devoted to dairy farming. He talks of the use of turnips as cattle and sheep feed being pioneered in the area and its importance for feeding the cities, and also mentions the importance of the supply to London of turkeys from Suffolk. The range of industries in the town in the 19th century were all the typical ones for a small market town. Retting of flax for linen was one of the less usual, matching similar industry at Diss. There were two principal breweries and less usually a firm specialising in making frames for the hanging of church bells. As an agricultural centre, Eye was caught up in the troubles of the 1820s when rioting broke out as machinery being developed to assist in farming was blamed for the loss of jobs. In February 1822 "the bad spirit which prevails in various parts of Suffolk among the labouring classes" openly showed itself "in the town of Eye." "A body of the labouring class went in a tumultuous manner to the farm of Mr Browning of Eye and dragged a threshing machine into the street." Whilst initially there was little direct damage to local machinery, a few days later a deliberate fire was started on Cobbold's farm, and unrest would go on through East Anglia for various reasons throughout the next two decades. Eye lay a few miles off the old Roman road, the Pye Road, which has today become the A140 from Norwich to Ipswich. It has thus always lain slightly off the main route. In the days of railway mania, Eye endeavoured to have the main line routed through the town, but when the Eastern Union opened the line in 1849, they had opted to run through Diss. A local line was opened by the Mellis and Eye railway company in 1867; this branch stayed open for passengers until 1931 and finally closed for freight in 1964. 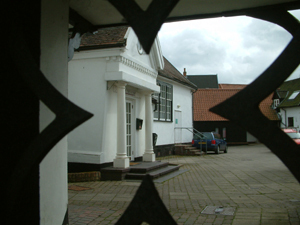 The visitor to the town should head for the offices at the town hall to obtain a copy of the Eye Town Trail leaflet, and those who wish to study Eye's history in more detail should obtain a copy of Suffolk historian Clive Paine's book on the town. Two Poppyland titles which will help expand particular areas of knowledge are listed below. SECTLINK('The Castles of Suffolk'^Misc#B14868) contains a detailed section on Eye castle. SECTLINK('Medeieval Flushwork of East Anglia'^Misc#B14869) by Margaret Talbot explains the background to flint flushwork, with many other Suffolk and Norfolk examples. 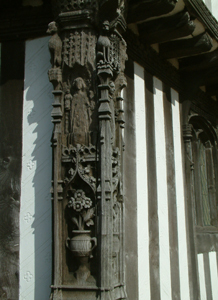 The corner or 'dragon' post of the Guildhall, which stands close to the church, is part of the original medieval work on the building. The figure is the Archangel Gabriel. 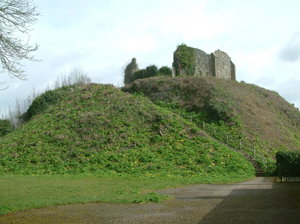 The motte of Malet's castle stands over the town. The building on the top is an 1844 folly, built by the then owners. The remains of the original castle are part of the curtain wall and some part of the bailey buildings. The whole of the church, especially the tower, is a splendid building. Here we show part of the porch, with bricks replacing what would have originally been flint in a flushwork chequerboard. At the foot of the porch is carved limestone, which originally held flint flushwork decoration. The Fisher family took touring theatre throughout East Anglia and built up a network of theatres in the market town. The Fisher theatre in Eye is one of the few that has survived over the years. 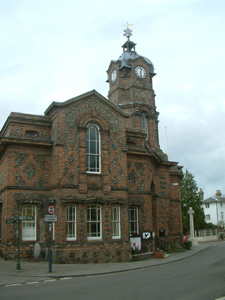 It is diffiult to be more flattering about the Town Hall than to describe it as 'interesting' or 'functional'; it uses diamond flint patterns set in brick - in some ways echoing the flushwork on the church. Architect E.B.Lamb doubtless felt he had created a building of its time amongst the more traditional styles in the town.